I receive pictures of shattered iPhone 4s every day. The glass used in its design is prone to shattering because its inner tension, and the bezel is too small to protect it. Here's the solution: A wooden back iPhone 4. It's the Gresso iPhone—for men and women. Their solution is just partial, since it only changes the back. But that's precisely the part more exposed to accidents and scratches, since the users are always placing the iPhone's back against different surfaces. And this phone looks a lot more beautiful and classy than the original, especially the plain version. 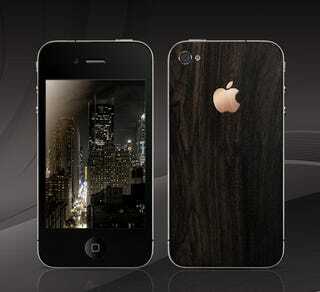 Both of them are made with 200-year-old African Blackwood, with the Apple logo made in 18K gold. I could pass on the gold—and the Swarovski crystals of the "version for ladies" too—but this would definitely be the iPhone 4 I would like to buy. If they fixed the antenna problem, that is. And if didn't cost $3,000.